I have two bird of paradise plants that have a weird mold or fungus growing on the underside of their leaves. 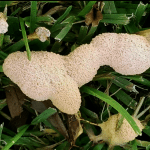 It is a white powdery mold that grows in small spots all on the underside. I have looked it up on the Internet but do not know how to really describe it. When we first moved into our house, there were quite a few ants living in the stems. Could that be causing this or could that only be adding to the mold problem? I also have a few shrubs that have a similar looking mold and whenever you brush against them, it looks like little white bugs fly off of them. I am really confused on how to fix these problems. Any help or advice is VERY appreciated.